While I was studying horticulture, plants and gardening design I accumulated quite a collection of books on the subject. After that I lectured for many years at The English Gardening School and I had to keep up with what was published in the gardening and plant world. So - a few more books was added to my collection. 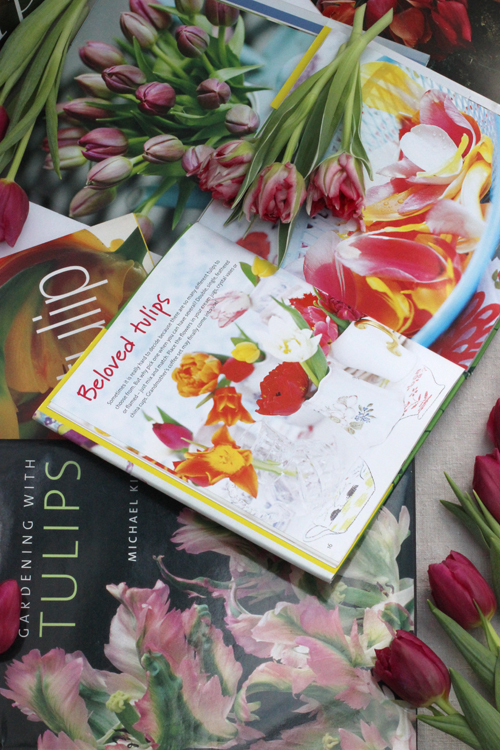 So today on Tulip Week - Day 4 - I'm feature a few books about tulips. The first one is called The Tulip and is written by Anna Pavord. Its more or less the definitive book on the history of tulips. Anna Pavord has been the gardening columnist for the Observer for over twenty years and has published many gardening books. In the inside dust-cover it says "The Tulip is not a gardening book. It is the story of a flower that has made men mad. Greed, desire, anguish, devotion have all played their part in the development of the tulip from a wild flower of the Asian steppes to the world-wide phenomenon it is today." I have included two books in Swedish - well, I'm Swedish and I know I have a lot of visitors from Sweden to my blog. The first one is by Sanna Töringe and is called Historier om Blommor and it's a collection of chapters on folklore, garden history and stories about flowers in art and literature. There is a chapter devoted to the tulip - very appropriately called Passion. The second Swedish book is called Tulpan and the editor is Cecilia Wingård. It's a collection of chapters written by different people and it also covers the history of tulips, growing advise, folklore and planting plans. 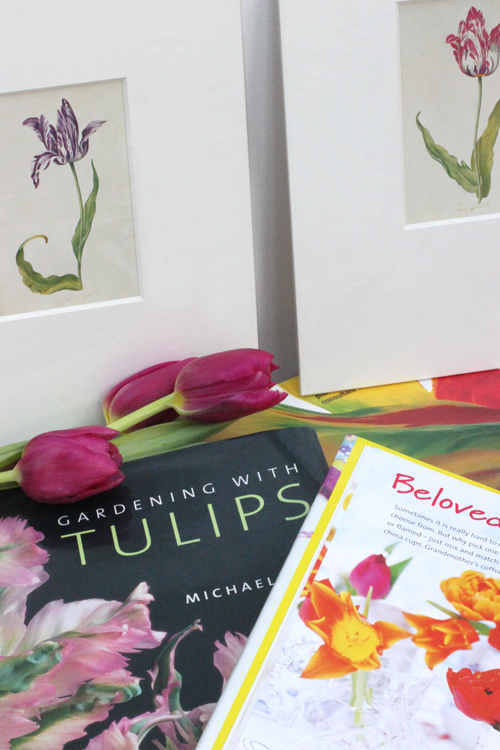 I have also chosen to feature two gardening book devoted to tulips. One called Gardening with Tulips by Michael King and the other is called Tulip by Liz Dobbs. Both full of information about tulips, how to grow them. I don't have any florist or flower styling books devoted to tulips but I have included two that do have a few tulip arrangement. Jane Packer's At Home with Flowers and Malin Hidesäter's book Flower Power both has quite a few pages featuring tulips. The last book to be featured is a books I love. 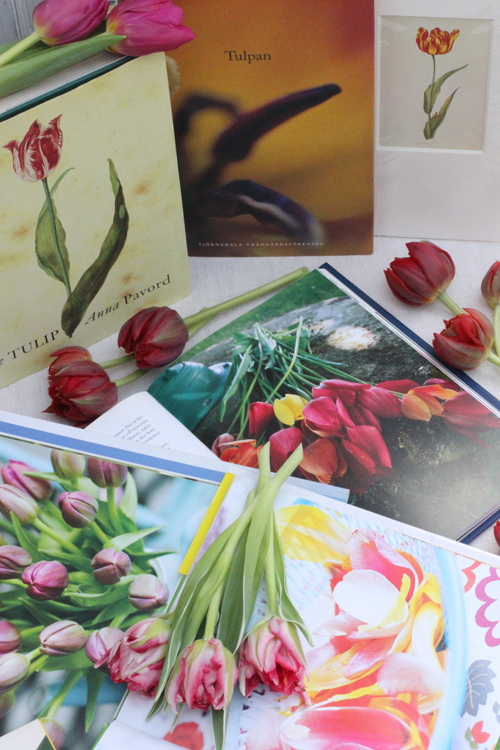 It's called Tulips and the introduction is by Scott D. Appell, it's an over-sized coffee table book that is more of a photography book than a gardening book. 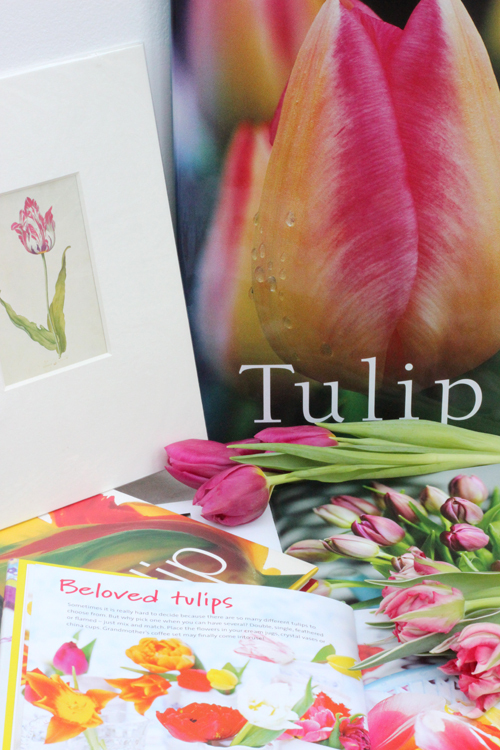 It has the most gorgeous full page images of tulips taken by top photographers. Each spread has a close-up of the flower on one page and a quote on the other. 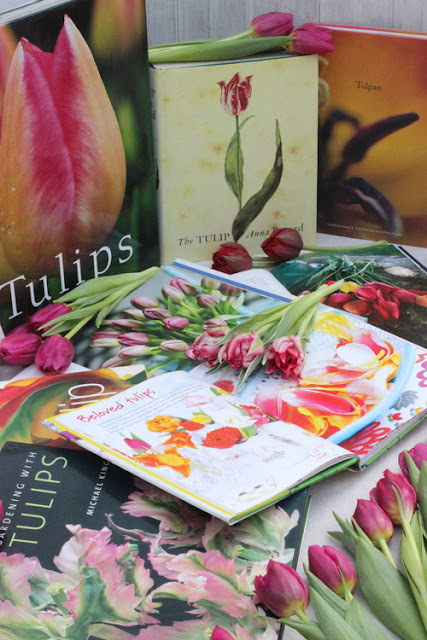 This is not any kind of definitive list of books on tulips - it's much more my very own collection of books that I have read and used as reference books over the years. All the English books are still available on Amazon. The two Swedish ones are out of print so you will have to look for them on secondhand book sellers. The last thing that I want to mention are the three small prints of tulips. They are painted in 1643 and the originals are at the Frans Hals Museum in Haarlem in Holland. Me and my husband bought them back in 2002 when we visited a gardening show just outside Haarlem. On my 'To Do' list is now yet another thing to do - "Take tulip prints to be framed"! Enjoy your flower arranging and have a fabulous floral Thursday! I'll see you again tomorrow with Day 5 of Tulip Week. It will be another FLOWERS by me and Titti and we are of course celebrating Tulip Day! I love tulips and tulip books, especially on these wet and grey winter days. Got a homemade pottered tulip vase from my daughter last week and bought (for this occasion) white tulips to brighten up the days. Ingrid, it was a pleasure to have this reminder of some tulip-related books and to be introduced to some that were completely new to me. Of course, what is a continuing pleasure is visiting your splendid site with all of its beautiful images and helpful information.